DO ALL WHOLESALERS WORK WITH HOME-BASED BUSINESSES? There seems to be an assumption out there that all wholesale companies work with all kinds of businesses no matter what, and that simply isn’t true. In fact, genuine wholesalers that are willing to work with small home-based businesses are very rare and hard to find. That’s why we’ve spent 18 years of full time research at Worldwide Brands to locate the 8,000+ LEGITIMATE wholesalers we list, who WILL work with home-based business. Wholesale companies are VOLUME businesses. Since they themselves work on a very small profit margin, they need to move a LOT of product through their warehouses on a regular basis in order to make money. That means they seek out LARGE accounts. They need to sell to big-box stores and companies in large volume in order to survive. Because they need to move large volume, they don’t like to break “case quantities”. Their operations work much faster and much more smoothly when they can bring in trainloads of cases of products from manufacturers, and send out truckloads of cases of products to large stores. In, out, done. “Breaking a case” (opening up a case of 12 or 20 or 144 products, etc.) and selling just a FEW of the products in that case causes problems. Their warehouse space is at a premium. They need every square inch of that space to be fully functional and dedicated to moving product in and out of the warehouse all the time. When they “break a case”, they have to put the REMAINDER of that case (which they can no longer sell to a big-box store) SOMEWHERE. Multiply that by the dozens or even hundreds of cases they would have to break in order to sell small quantities to small businesses, and you can see that their critical warehouse space gets jammed up with partial boxes of products that are just sitting around taking up valuable space waiting for another small order. That affects their efficiency tremendously. Working with home-based business REQUIRES that they break cases, and THAT requires that they hire MORE EMPLOYEES, which raises their cost of doing business and cuts into their profit margins. When you’re just moving cases of products from a warehouse location to a loading dock with a forklift and sending truckloads of products to big stores, that’s EASY. When you have to break cases, then pick, pack and ship small quantities of products to small business customers, it takes MORE PEOPLE to do that work. Picking, packing and shipping small quantities means setting up ‘small volume shipping stations”. Depending on the size of the wholesaler, they may have to set up 1, or 2, or 5 or more separate “stations” where their new employees stack, pack and ship those small quantities. This also takes up more valuable floor space, and requires an investment in setting up the stations, and in buying individual shipping products like small boxes, fillers, shipping labels, label printers, etc. Working with home-based business requires more ADMINISTRATIVE staff. When a wholesale company opens itself up to working with home-based business, they get TONS of small new accounts. SOMEBODY has to set up and manage those accounts. That means they have to hire more people in the Office to do that. Depending on the size of the company and the number of accounts, this can get VERY costly. Working with home-based businesses requires that the wholesale company set up a different type of shipping account with UPS, FedEx, USPS or whatever shipping company they use. Direct distribution of case loads of products is one thing; shipping out individual products all day long is quite another. THAT comes with additional administration and expense as well. SO YOU CAN SEE that by and large, wholesale companies are VERY reluctant to do this. It’s not simple. It requires a great deal of planning and expense, and forces the company to re-work it’s entire business model. How do I KNOW all this? I used to OWN a wholesale company in New York. My company sold to both big stores AND to small home-based businesses; we instituted a drop-ship program for web site owners. So yes, I’ve been down that road and lived through all of the planning, expense, hiring and added administration that it requires. Having been in this business for 24 years, I’ve seen a LOT of people who completely misunderstand wholesale suppliers. Wholesale suppliers who are legitimate are a critical part of YOUR business success. The more you understand about them, the better off you are. Understanding that wholesalers who will work with home-based business owners like yourself are RARE and hard to find helps you understand that you can’t just go to Google, type “wholesale”, and expect to find companies who will jump at the chance to work with you. That’s nothing personal; it’s just based on the way these businesses operate. Understanding that the LEGITIMATE (for more on why I include that word here, see Day 1 of this series!) wholesale companies who can help you the most are rare and hard to find helps you to understand what WE do here at Worldwide Brands as well. AND it helps you to understand why it’s so important that you use our Directory. 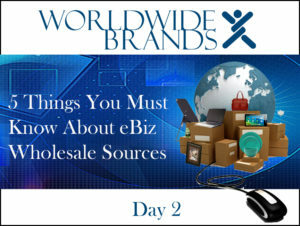 “5 things you MUST know about EBiz Wholesale Sources”, Day 3: WHAT SHOULD YOUR PROFIT MARGINS BE? Read it now! This entry was posted on Tuesday, July 18th, 2017 at 1:00 pm	and is filed under wholesale tips. You can follow any responses to this entry through the RSS 2.0 feed. You can leave a response, or trackback from your own site.